According to Israeli media, representatives from the Jordanian Embassy in Tel Aviv participated in an event with Israelis in establishing an ‘island of trees’ in Al-Baqoura, bearing the names of the Israeli girls who were shot dead by the Jordanian soldier Ahmed Daqamseh in 1997. 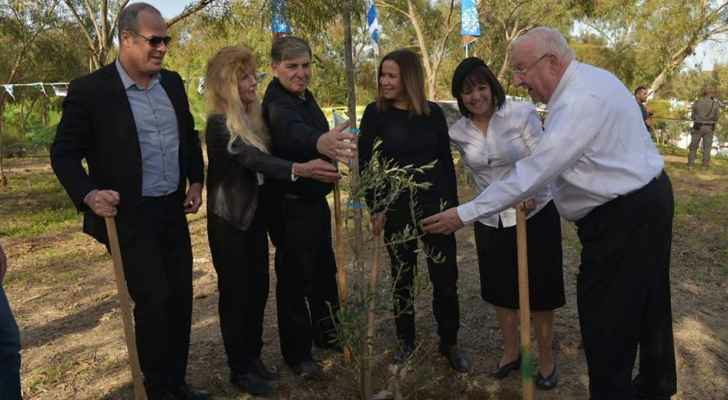 Israeli media published pictures of the activity and the participants showing employees from the Jordanian embassy in Tel Aviv planting trees along with the families of the Israeli girls. The Israeli media said that an interesting meeting took place in the "Flower Garden" in Al-Baqoura, where the Jordanian consul and the Israeli President, in addition to the families of those killed. "The island of peace must remain an island of peace, a symbol of friendship and hope for the two peoples," said Israeli President Reuven Rivlin. 22 years ago Jordanian soldier Ahmed Daqamseh with his automatic weapon shot a group of Israeli girl students killing 7 and wounding 5 in addition to one of their accompanying teachers. He served 20 years I prison and was released about two years ago.